Gigantic's New Hero Included In Update | Nerd Much? 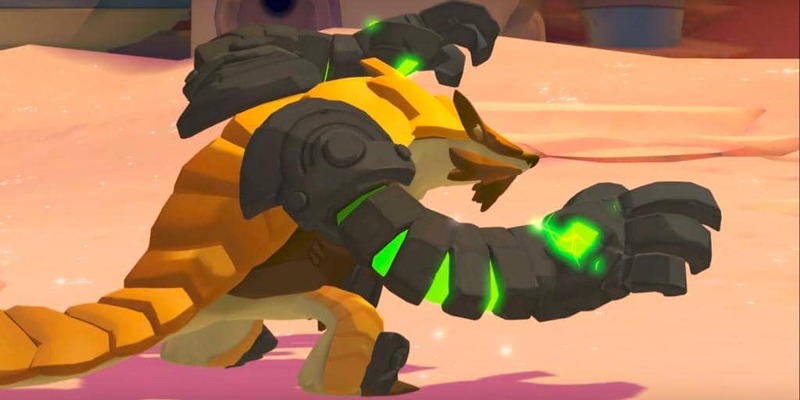 He’s a pangolin with rock armor that regenerates the moment you’re out of combat. The developers of Gigantic have released a brand new update titled Into Solitude. The update includes a new Hero by the name of Rutger, two creature variants, and monk-themed skins. Digging Claws is his basic rapid melee attack that restores his shield per hit. In addition, the more you use it, the more powerful the attacks become, turning into Digging Deeper and Clawing for Shield. Tremors is an attack that pounds the grown three times, the first two slow enemies down and the last pushes them away entirely, dealing damage all the while. Burrow is probably the most useful out of all of these attacks. You can literally go underground, which renders you invulnerable and restores your shield instantly. You can even use it strategically and pop up under enemies to deal damage. The Rock Barrier can be used as an attack, as once it is destroyed it deals damage. But it can mostly be used to block all movement and projectiles. Rutger’s focus skill and the most useful besides Burrow, is Rock and Roll. You can use this by charging up and rolling forward. Enemies will be blown away and damage will be dealt. Rock and Roll will also regenerate your shield and you’ll be immune to any disruption attacks. The two creature variants this update includes are Stone Cerebus and Riftborn Cyclops. Stone Cerebus is just that, a stone version of our favorite three-headed dog. Being made of stone, his melee attacks are a lot stronger than he furry counterpart. Riftborn is “blessed with the magic of the Rift” and can use that magic to immobilize enemies, and call up transparent walls that can only be penetrated by allies. The same goes for Rutger’s Rock Barrier. The update will also include monk-themed skins for everyone and special skins for Wu, uncle Sven, and Charnok. Each will be released on a different week. Come September 19, players will receive Stone Cerebus and Wu skins, September 26 will be Riftborn Cyclops and Uncle Sven skins, October 3 will see the skins for Charnok. Rutger is already available. Gigantic is a free-to-play game on the Xbox One and PC. Be sure to check it out and try not to compare it to Overwatch.